Those arguing for US military action in Iraq to stop the advance of ISIS/ISIL (Islamic State in Iraq and Syria/Iraq and the Levant) frequently claim that if the United States does not take action and ISIS prevails, Iraq will become a launching pad for terrorist attacks against the United States. This argument frequently gets run whenever anyone wants to intervene in a Middle Eastern country, but does it really stand up? Let’s investigate. 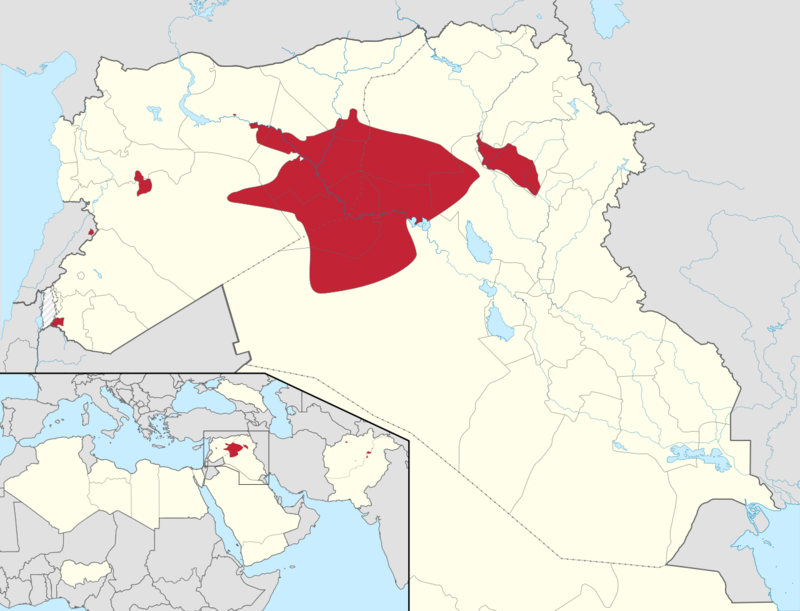 In red is territory ISIS controls at the time of writing (late June 2014), in yellow is territory it operates in or claims but does not yet control outright. It will be extremely difficult for ISIS to defeat the Iraqi or Syrian states outright, but let’s say, hypothetically, that the United States stays out and ISIS scores a stunning victory, capturing Baghdad and executing al-Maliki. What’s likely to happen after that? Does Iraq because a terrorist launchpad? States like these [Iraq, Iran, North Korea] and their terrorist allies constitute an axis of evil, arming to threaten the peace of the world. By seeking weapons of mass destruction, these regimes pose a grave and growing danger. They could provide these arms to terrorists, giving them the means to match their hatred. They could attack our allies or attempt to blackmail the United States. In any of these cases, the price of indifference would be catastrophic. We will fight the terrorists overseas so we do not have to face them here at home…If we give up the fight in the streets in Baghdad, we will face the terrorists in the streets of our own cities. We can decide to stop fighting the terrorists in Iraq, in other parts of the world, but they will not decide to stop fighting us. Does it make sense for rogue states to sponsor terrorist organizations that attack the United States? We’ve tended to presume it is, but perhaps this assumption needs to be challenged. What would be the rationale for a state like Iraq or Afghanistan to spend money funding a terrorist organization instead of that country’s own military forces? Presumably if a state were to use its own military forces to attack the United States, the United States would retaliate against that government. It’s often argued that by funding terrorist organizations, states can inflict wounds on the United States without being held responsible for those wounds. But this explanation does not bear out–when the United States was attacked by terrorists on September 11, 2001, it did not see any distinction between terrorist organizations and the states it perceived to be sponsoring them. On the contrary, the United States proceeded to attack and dismember two states in response to that terrorist attack (Iraq and Afghanistan). If the United States is prepared to attack states for things that terrorist organizations do even when the connection between the state in question and terrorism is weak or non-existent, there is little reason to believe that states would sponsor terrorist organizations. Terrorist organizations operate independently from states and are notoriously difficult for states to control. The mere fact that Osama Bin Laden was in Afghanistan got nearly the entire leadership of the Taliban killed, and the mere fact that George W. Bush didn’t like Saddam Hussein got him killed as well, even though he had no Al Qaeda association. Given that when the United States is attacked by terrorists it begins indiscriminately attacking Muslim autocracies, it follows that, if I am a Muslim dictator, I not only do not want to sponsor terrorism, I want to prevent terrorists from attacking the United States and drawing its gaze upon me. It’s often forgotten now, but even the Afghan government realized it wanted no part of the US response to 9/11, quickly offering to arrest Bin Laden in the face of the US bombing campaign. Osama Bin Laden himself claimed that the Afghan government had no knowledge of the 9/11 attacks, for whatever his words are worth. If Afghanistan knowingly sponsored a terrorist attack against the United States, it has been made an example of and illustrated the foolishness of state sponsorship of anti-US terror. If the Afghan government did not know, it sorely misjudged the existential threat Al Qaeda posed to its regime in the form of US retaliation. In either case, all states can now see that the quickest way to get themselves carpet bombed is to permit a terrorist organization to launch an attack against the United States from their territory. So if ISIS wins in Iraq, it is unlikely that ISIS will sponsor anti-US terrorism because if it did so, the United States would certainly destroy it. Even if ISIS were a wholly irrational organization, ISIS would still be unlikely to sponsor terrorism against the US because it would almost certainly have its hands full handling insurgent Shiite militias in Iraq, Iran’s Revolutionary Guard, the Kurds, the Syrian Army, Hezbollah, and its rival rebel groups in Syria. It would be imprudent and suicidal in the extreme for a 10,000 strong rebel faction to pick a fight with the distant United States while those bad boys are challenging it from all sides. In the event of an ISIS victory, the biggest concern for the United States will be stable access to the oil in the gulf, which it should ensure by engaging ISIS diplomatically. There’s no obvious reason ISIS can’t sell the oil in place of al-Maliki, provided it can hold the territory, something al-Maliki evidently is struggling to do. Ultimately, it makes little difference to long-term US interests who rules Iraq, provided those rulers keep the oil supply flowing. No sane Iraqi government is going to sponsor anti-US terrorism, whether it’s run by crypto-Persian Shiites or medievalist Sunni extremists. When you get right down to it, whether ISIS wins or loses, America can shrug. What a monumentally foolish point of view. You know nothing of what these people are about…absolutely nothing. Trying to sound reasoned and deliberative doesn’t make you either of those things. Your mindset will result in civilization succombing to barbarism. Congratulations and good luck. We have to be careful not to engage in threat inflation. This is how billions of dollars get spent to little ultimate purpose. Keep an open mind, Truth. It is always good to read on both sides and properly educate yourself, even if you do not agree. You never know which side is actually 100% correct. There were a lot of events that took place with sadem, 911 certainly wasn’t the beginning. Our reasons for going over there were of nuclear ones. Not 911 ones. Don’t try to rewrite history. It will not bring back the tens of thousands found in sadem mass grave sites. What nuclear you are talking about!? Eventually the US will have to make some kind of accommodation with a movement that it can neither control nor destroy. It’s a nasty bunch, and one Bush largely created through breathtaking incompetence (not least lying his way into a lost war). But that doesn’t change the facts on the ground. We’ll probably get closer to Iran as a counterweight. None of this is new; even some of the ancient Greek states made alliance with Persia against each other. Machiavelli laid out the need for a country to have interests, not friends.